Surprisingly I woke up at an early 10:15 and more surprisingly, got up at 10:45. I got into my running outfit and went for my run at 12:15. 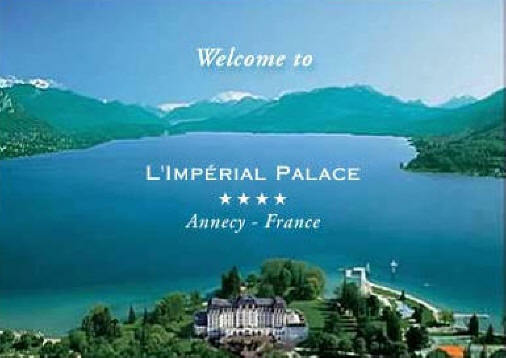 I ran directly to Lac D'Annecy and then through the large park called Jardins de l'Europe which is huge and very nice. 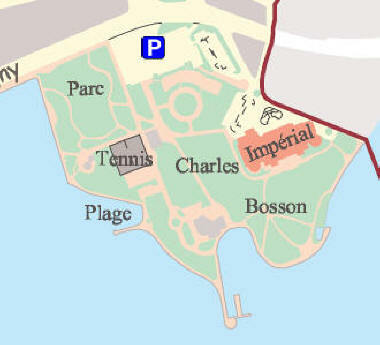 As I headed north, I came across the Imperial Palace (photos below) in the governmental area backing up to the lake. It was so covered with trees I really couldn't get a shot of the whole thing so these are stock photos. 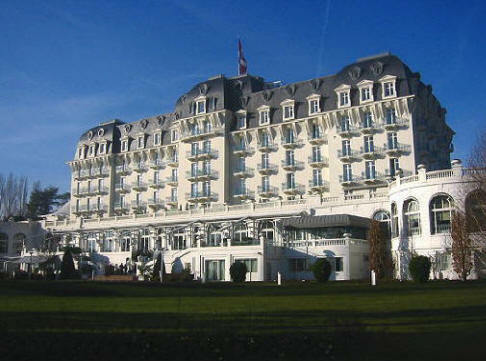 You can see the position of the Palace on the lake and its beach (plage). The photo above left is of the town hall Prefecture taken by me through the heavy line of trees surrounding it. 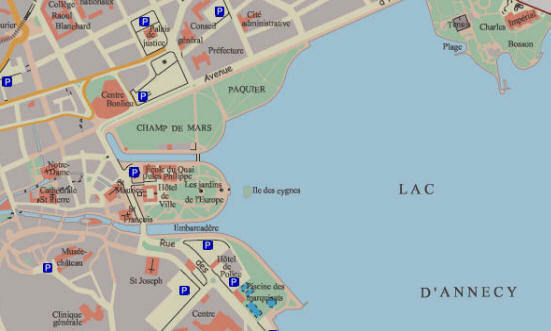 The maps below show the City of Annecy and the extent of the parks, Jardin de l'Europe, Champs de Mars and Paquier and their relationship to the city and the lake. The park was very peaceful to run in, with the cool zephyrs from the lake blowing across my face. 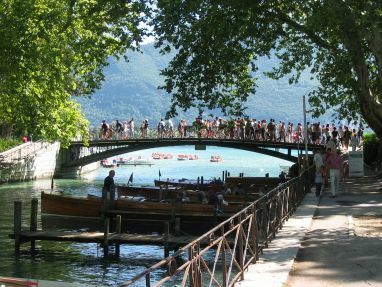 Many people were out having their lunch in the park or even on a deck on the Thiou River canal flowing into the lake. At the end of the canal is Pont des Amours (Lover's Bridge) and above right and below left are stock photos of it in the fall. Annecy is competing for the 2014 Olympic games and this is the logo they are using for their campaign. The city and this park are laid out just beautifully. In my opinion, it doesn't get better than this. These are the views of the lake from the Champs de Mars park and city near the boat docks. The below panorama photos were created using Canon's PhotoStitch. If you look in the far right (above the sailboat) in the photo above you can see Mt. La Tournette (close-up below) which is 7,711 ft (2,350 m) high. Its turreted peaks can be seen. 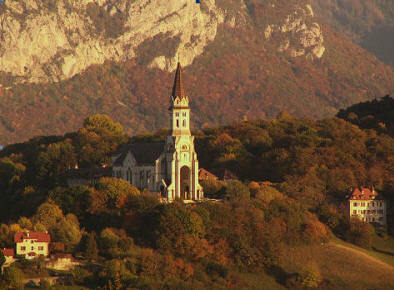 Above right and below left is the monument of Claude Louis Berthollet (left) who was born in Talloires, near Annecy, in 1748. Berthollet, along with Antoine Lavoisier, devised a chemical nomenclature which serves as the basis of the modern system of naming chemical compounds. He also carried out research into dyes and bleaches (introducing the use of chlorine as a bleach) and determined the composition of ammonia. He became a physician in Turin in 1768 but had to get a French license when he moved to Paris. 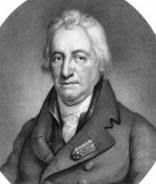 He taught chemistry to Napoleon and when he later became a senator, he voted to depose Napoleon. He died 11/22/1822 and the monument was erected by citizens and admirers in 1843. It was very, very hard to leave this place but we needed to head out after two wonderful days here. I walked back to the hotel and on my way I came across this large monument to St. Frances de Sales. As I headed further on toward the central town, I came across the modern tour boats that go around the lake and the building where you can buy tickets for tours from 45 mins to 2 hours. 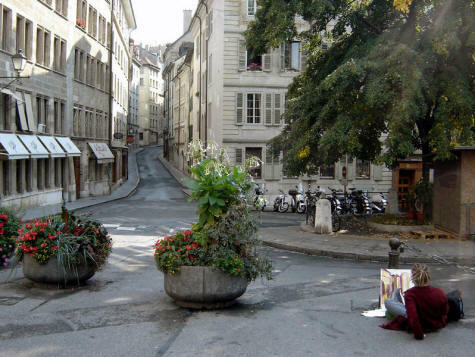 I then went by the City Library (below left) next to the Mayor's house (below right). Next to the modern Palais de Justice building was a monument to both World Wars. I finally wended my way back to the Le Munich bar and the hotel. This view of the church Basilica de le Visitation on the hill was from the hotel. Above a final goodbye to this most charming town. Below are some postcards. L'Aigille du Midi (below right) sits to the left of Le Mont Blanc in the photo below left. Above right is the mighty Mont Blanc hovering above the lake. 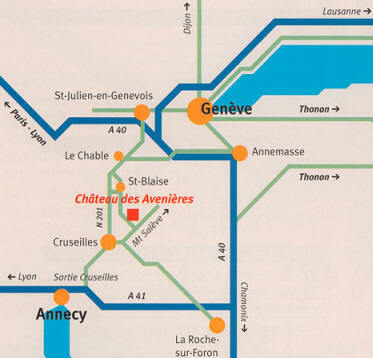 Below is a map of the route of the tour boats that call on the little towns around the lake. 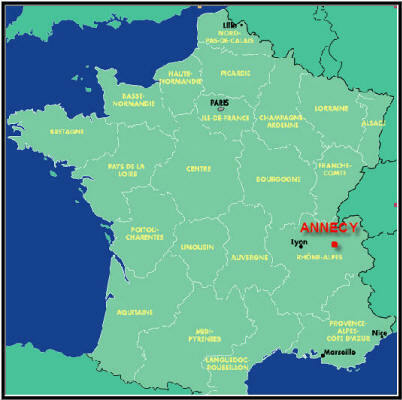 The second town on the right called Sevrier is where we headed to after leaving Annecy. At 1:00 I reached the hotel and we packed and checked out. By 2:00, we walked to my favorite bench near the antique shop and at 2:30 I got on the Internet to AOL and downloaded Rush and uploaded Diario #16. I noticed that I had left my glasses in the room (like I did in Moscow in '01) so I walked back to the Ibis and this time I was lucky and found them. At 3:40 I had a cappuccino at the bar. I realized there were some things we missed on our visit here. 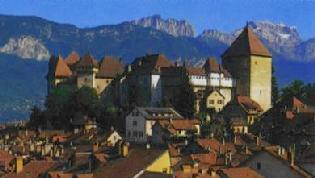 One was the Annecy Castle which is just above the town. You can tour around inside but we weren't aware of it from our vantage point and we didn't have time anyway. 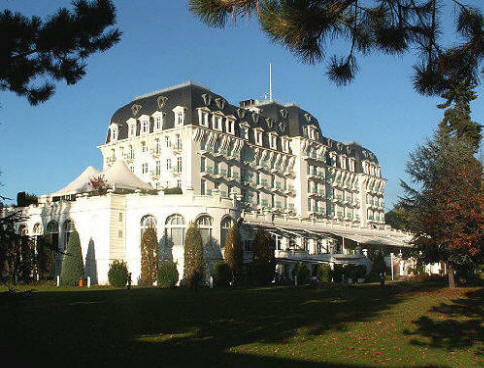 Its enormous 13th Century Tour de le Reine forms the oldest part of a massive ensemble. 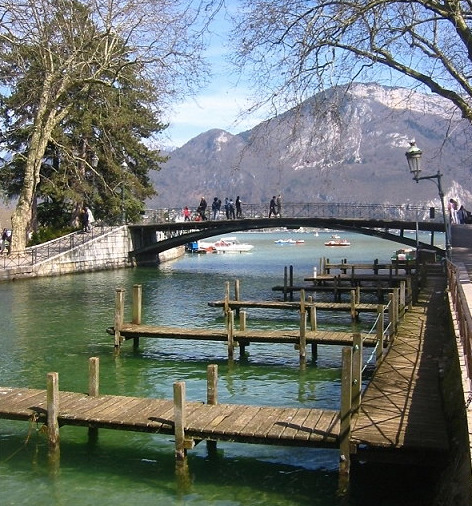 The 14th-15th Century Gothic Logis Vieux and the 16th Century Renaissance Logis Nemours contain a regional museum filled with religious statues and views of Annecy. 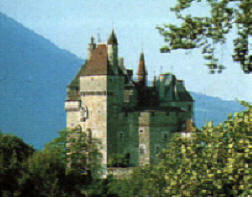 The other was Château de Menthon. It is in the mountains near Menthon-St-Bernard which it overlooks. The Château de Menthon has many towers and it claims to be the birthplace of St-Bernard at the end of the 10th Century. He did much to promote piety here and cared for mountain travelers. He set up monasteries at the Petit Bernard and Grand Bernard passes. 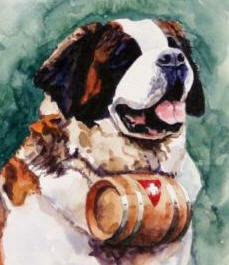 It is here that the dogs named after him are trained to help in Alpine rescues. 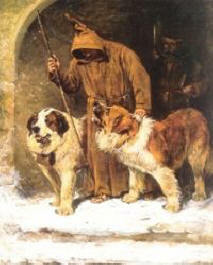 This breed started with the monks here in the 17th-Century. L'Aiguille du Midi is called "the Needle" by the French. In the late 1400s, King Charles VIII passed through here and on a whim asked Antoine de Ville, one of his lords, to climb the mountain. 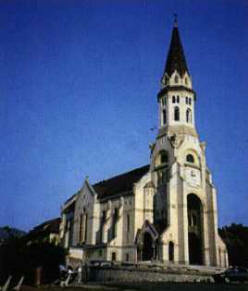 They accomplished it by using ladders and this became the first example of mountaineering in France. Here is a view up in the mountains above the city. 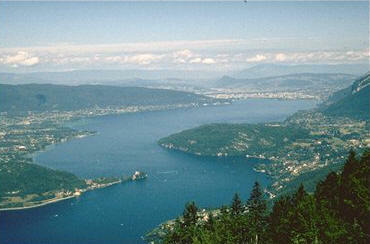 Below are aerial views of Annecy and the Val de Isere. At 4:00 we drove up the winding road to the top of the hill where the Basilica de le Visitation (erected in 1949) holds the crypts and relics of St-François de Sales and St-Jeanne de Chantal. Below left is Marcia getting out of the car. 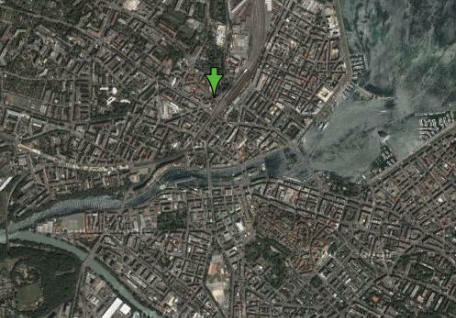 Below you can see the position of the Basilica in relation to the town and Mt. Tournette. 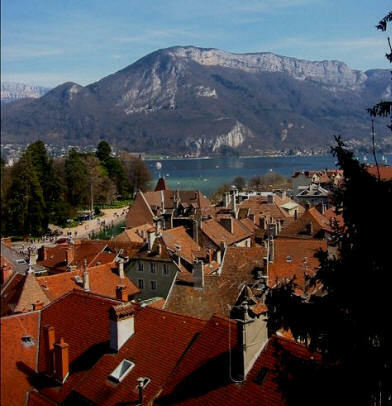 Above and below are stock photos of the church and from the hill you can see the Annecy's old town called Vieux Quartiers. At 4:30 Marcia drove the 5 miles north to the shore village of Sevrier. 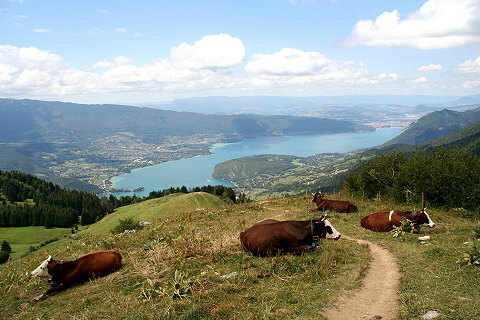 We got out and took some photos looking back at Annecy, which you can see off in the horizon. 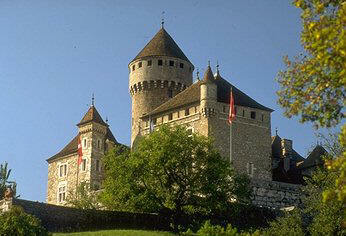 Above are stock photos of the medieval Château de Montrottier which has a 15th Century keep rising from the courtyard. 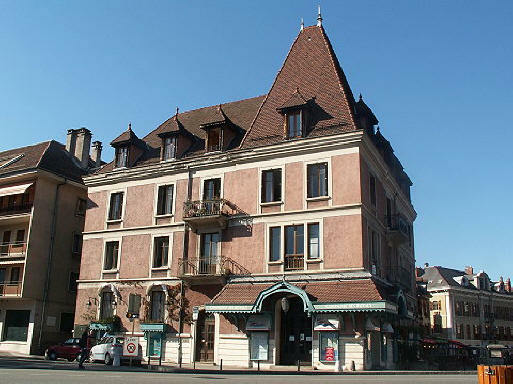 It houses collections of Léon Marès which were bequeathed to the Académie Florimontane. 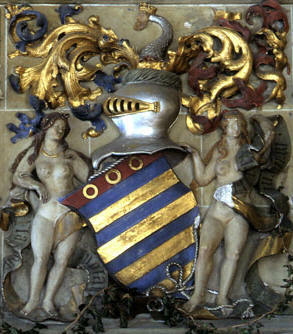 It houses weapons, tapestries, Napoleonic objects and the Vischer's Renaissance bronzes of the Battle of the Centaurs. The bronzes were originally frowned upon because of too many bare male buttocks. 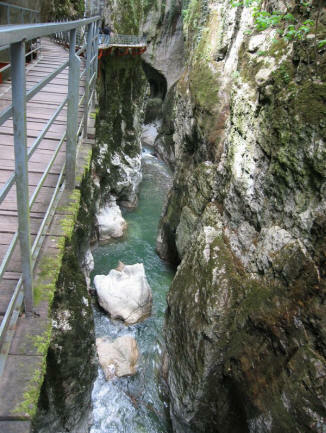 Nearby to the castle, the path along the edge of the narrow and precipitous Gorges du Fier is dizzying. We didn't see this but I wanted you to. 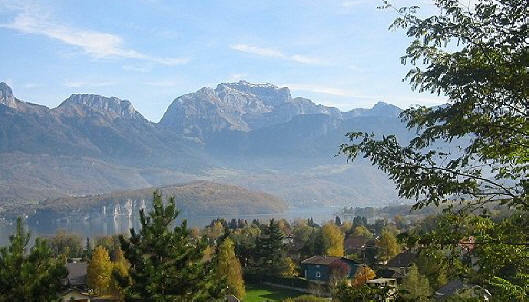 East of here is the Aravis mountain range reaching 8200 ft (m) just before the Mont Blanc range (below.) 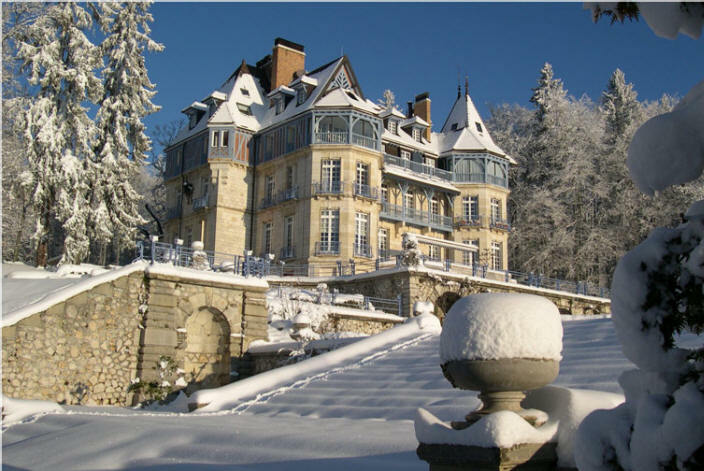 If you take the high road through Dingy and Aviernoz you can reach the castle Château de Thorens once owned by François de Sales the Elder. Another famous ski area near this region is Courchevel which was also the host for an Olympic games. At 4:45 we filled the gas tank at AVIA and it cost us $5.76/gal for 66.7 liters (17.6 gal[€1.26/liter]. 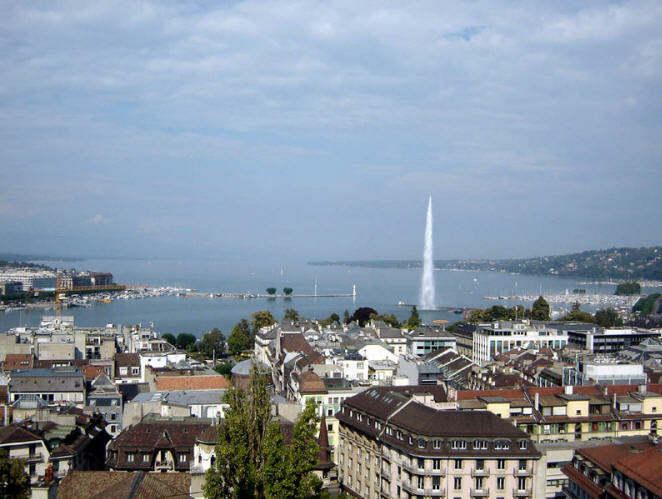 At 5:00 we headed to Genève and Marcia drove the 40 miles to get there. On the route there we could have stopped at the Château des Avenières, but we didn't know about it and besides we just didn't have the time. But it is so interesting, I had to include information on it for those that might want to see it. Built at the beginning of the 20th century by a wealthy American woman and furnished by a lover of antiques who was of Indian ancestry (her husband, Assan Faride Dina.) 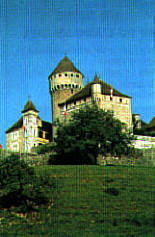 The Château des Avenières has always been an object of curiosity. Mary Wallace Schillito was born in 1876 in Cincinnati, Ohio. Her father, a powerful businessman, made his fortune in railroads. From childhood, Mary greatly admired her sister Violette, a beautiful and delicate young girl. As teenagers, the two sisters delved into the "delights" of Paris in its Oriental period. Occult sciences, Sapphic poetry, culture and music…Mary and Violette led a rich "interior life" until 1901, when Violette died of typhoid fever in Cannes. Heartbroken, Mary traveled widely in search of peace of mind and a place to celebrate the memory of her beloved sister. She bought the land here in 1905. Above is the flag of the nearby region of Evian-les-Bains (see map) which is the tip of France (Haute Savoie) that juts into Switzerland around Lake Genéve. We finally arrived at the Swiss border at 6:00 and we thought we would try the "I'm leaving the EU" excuse again to cash in our Tax Free stuff at the Swiss Customs but again they would have nothing of it. They were adamant that we do it when we fly out of Paris. We decided to give up on this idea. 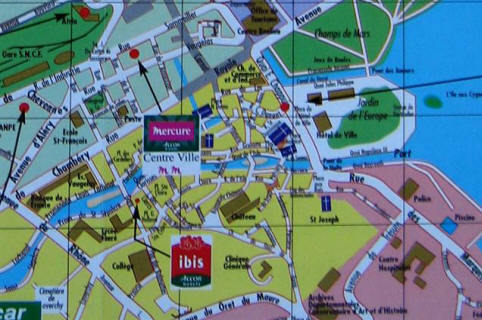 We arrived in Genéve (pop 185,526, area 700,000) at 6:15 and checked into the Ibis Genéve Centre Gard [10 rue Voltaire, +41-22-338-2020]. As usual the room (right) wasn't very big or luxurious, but it was clean, economical and worked just fine for our needs. 132 gallons/sec (500 liters) of water are jetted to an altitude of 460 ft (140 m) by two groups of pumps. The water leaves the nozzle at a speed of 124 mph (200 km/h.) When it is in operation, at any given moment there are about 1,850 gallons (7,000 l) of water in the air. We didn't get to the small streets (below left) but only the busy traffic. At 7:30 we drove from the hotel through the bustling traffic to this large park (below) which didn't inspire us as to the city's green-space. We parked in the marked underground lot and at 7:45 we headed out using the map the hotel gave us, aiming for the Old Town. It took quite a while to get there and Marcia was wishing we had taken a cab. 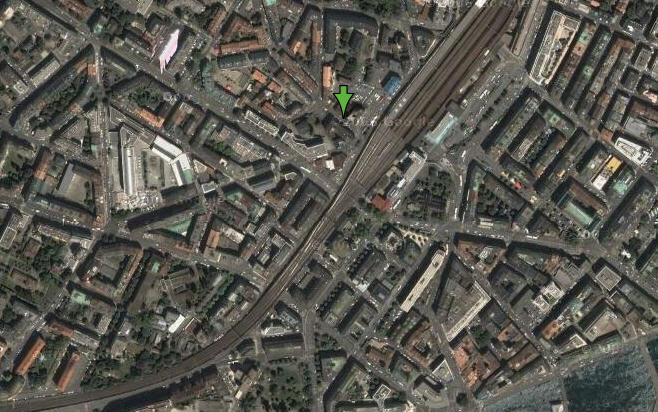 The satellite maps below show the center of the city. 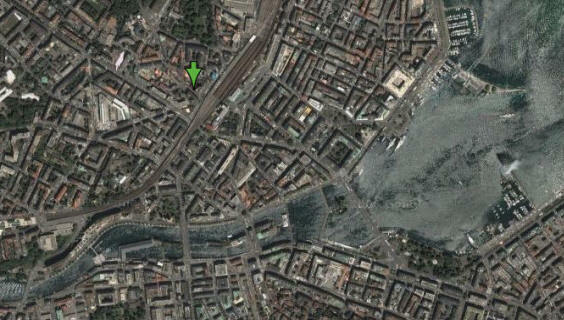 You can see on the right, the tip of Lac Genéve giving birth to the Rhône River flowing through the city. 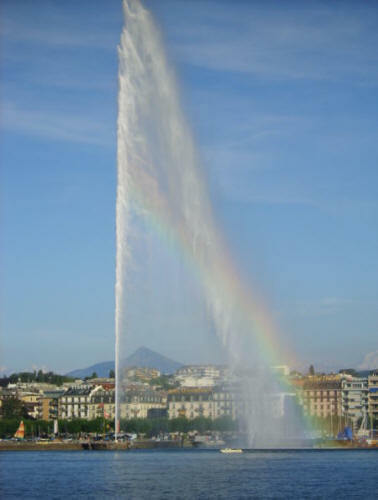 You can see the Jet d'Eau as a tiny white spout center right in photo below right. It was a long walk to finally find something that looked like civilization. 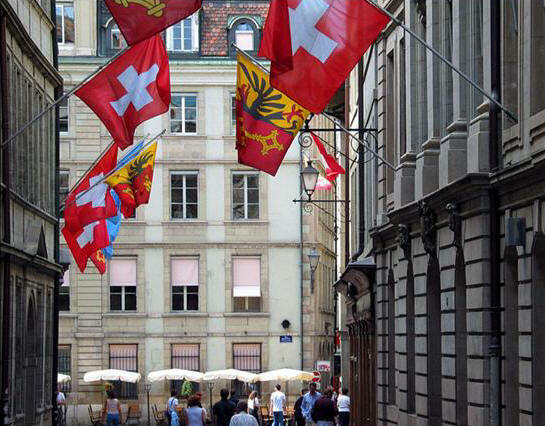 I then realized that we didn't have one franc of Swiss currency between us and could not pay for the drinks we ordered so I headed out looking for an ATM. They told me to head down this steep hill. I had to walk down the hill and only at the very bottom did I find an ATM. I withdrew 100 Swiss francs (CHF) and then trudged slowly back up the hill. It gave me a chance to look at the all the shops and the other eateries in the neighborhood. After I got back to the café, we sat and talked about where we would eat. It was Friday night and it was pretty lively. After looking around, at 9:20 we sat down for dinner at the Café du Bourg-de-Four [13 place du Bourg-de-Four, +41-(0)22-311-9076]. They seated us inside, right next to a guy smoking a huge smelly cigar. I complained to the waiter that it would be impossible to eat with that blowing in our faces. He finally moved us out onto the exterior patio which at least gave us some fresh air. We relaxed finally and went through the menu. We ordered Passugger water and a bottle of red Syrah from Cave de Tain l'Hermitage. The paper placemats were interesting. I started out with a ham omelet as an appetizer while Marcia had a small salad. For our main course, I had filet mignon with peas and hash browns (left) while Marcia had a large wurst (hotdog) on hash browns (right.) We both thought they were pretty good. For dessert I had ananas (pineapple) followed by an espresso and Marcia had creme brûlée and a glass of Courvoisier. After dinner we sat there for a while people-watching and then at 11:45 we took a taxi back to the hotel for $11, thus leaving the car in the underground garage. I wanted to walk back but Marcia won out. I then had an espresso and got on WiFi to download Rush and do my AOL email. I got to bed at 2:45 AM. Not a super exciting day but it was fun.